ChildHelp | NOT IN MY WORLD!!!! At Childhelp, we feel strongly that if we all work together we can help bring this number from five to zero. Close to 5 Children die every day as a result of child abuse in the United States. Every year more than 3 million reports of child abuse are made in the United States involving more than 6 million children (a report can include multiple children). 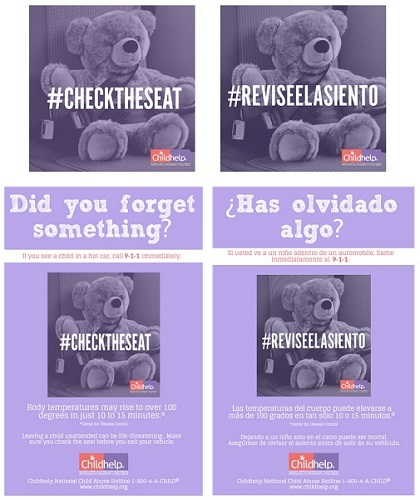 A report of a child abuse is made every ten seconds. Did you know 5 children die every day due to child abuse and neglect? Yearly, referrals to state child protective services involve 6.3 million children, and around 3 million of those children are subject to an investigated report. In 2012, state agencies found an estimated 686,000 victims of child maltreatment, 3 but that only tells part of the story. The U.S. Centers for Disease Control and Prevention links adverse childhood experiences (which include other household dysfunctions along with abuse and neglect) with a range of long-term health impacts. Ischemic heart disease (IHD), Chronic obstructive pulmonary disease (COPD), liver disease and other health-related quality of life issues are tied to child abuse. In one study, 80% of 21-year-olds who reported childhood abuse met the criteria for at least one psychological disorder. The long-term financial impact of abuse and neglect is staggering. For new cases in 2008 alone, lifetime estimates of lost worker productivity, health care costs, special education costs, child welfare expenditures and criminal justice expenditures added up to $124 billion. We must learn to recognize early signs of abuse in order to help save the 5 children that die every day from child abuse and neglect. In 2012, state agencies identified an estimated 1,640 children who died as a result of abuse and neglect — between four and five children a day. However, studies also indicate significant undercounting of child maltreatment fatalities by state agencies — by 50% or more. That’s roughly ¼ of your child’s elementary school class. 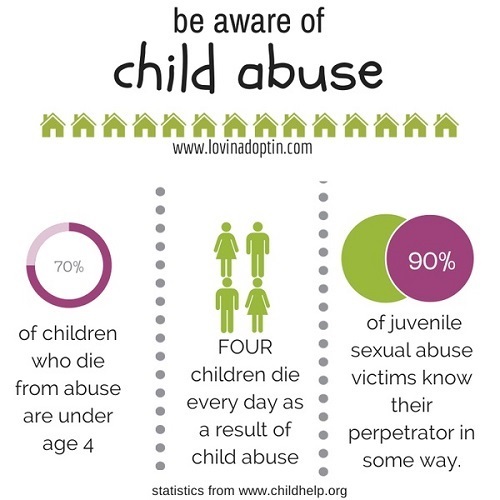 Around 80% of child maltreatment fatalities involve at least one parent as perpetrator. 4.5 Estimated Child Fatalities Per Day Attributed to Child Maltreatment. Substance Abuse and child maltreatment are tragically and undeniably linked. In a study of 513 children exposed to drugs in-utero, rates of abuse were two to three times that of other children in the same geographical area. 6. Amy B. Silverman, Helen Z. Reinherz, Rose M. Giaconia, The long-term sequelae of child and adolescent abuse: A longitudinal community study, Child Abuse & Neglect, Volume 20, Issue 8, August 1996, Pages 709-723. 9. Jaudes, P. K., Ekwo, E., & Van Voorhis, J. (1995). Association of drug abuse and child abuse. Child Abuse and Neglect, 19(9), 1065-1075. 11. Swan, N. (1998). Exploring the role of child abuse on later drug abuse: Researchers face broad gaps in information. NIDA Notes, 13(2). On a seemingly comfortable day, temperatures inside a car can rise quickly and dangerously. For a child, this can be life-threatening. Childhelp wants everyone to play it safe during these hot summer months. Download and share the graphic below with your friends, family members, and social networks. Encourage a local business to participate by displaying a poster on their front doors. Together, we can make sure every child stays safe. All Children deserve an equal chance to be Loved, Cared For, Have A Proper Diet, and Know That They Are Safe; and as they grow be taught Honor, Truth, Respect, Responsibility, and Duty in regard to themselves, others, and as young future citizens. Every day we see the same people and Organizations working tirelessly, with a selfless devotion for Our Children. We are not associated with any of these Organizations, however, they have Our Admiration, Respect, and Support. National Center for Missing & Exploited Children, Ark of Hope for Children, The Family Place, Operation Underground Railroad, ChildHelp.org, and ASPCC.